Note: Plenty of people have had the round icon and app shortcuts all along. This isn't unexpected, but may not have come across properly in the text above. Sorry for the confusion, but this section was meant to be a side node, not the main point of the post. The app shortcuts and round launcher icon are here for YouTube – or maybe it's better to say they're back, depending on your situation. 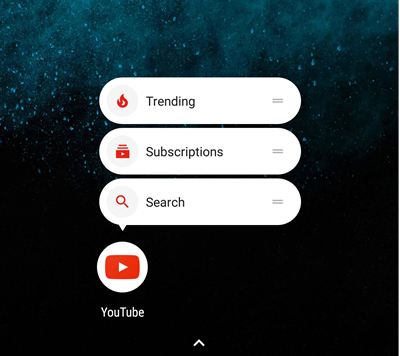 If you owned a Pixel (which shipped with YouTube v11.29) or installed one of the right versions on a device supporting app shortcuts, then you've already seen these before. We've seen quite a few apps including the app shortcuts, and there's nothing too out of the ordinary about these. Two of them are links that go directly to tabs on the main YouTube interface: Trending and Subscriptions. There's not much value to those specific shortcuts unless you want to tear one off and place it on your homescreen, which makes plenty of sense if you're already going to one of those tabs more frequently than the regular landing screen. The third shortcut immediately opens the search interface in YouTube. Again, it's not really saving any taps, but it might be useful if you want to avoid even the possibility of being distracted by another video listing. Anybody feeling déjà vu with this topic? For more than a year, we've seen evidence the YouTube developers have been experimenting with different interfaces for quickly moving through videos with some precision, something that can't be done very well with the seek bar. A small percentage of users have been fortunate enough to be part of test groups that get to try out the new functions, either the swipe-to-seek version we've seen in Play Movies or a pair of forward and reverse buttons for skipping. None of the variants have ever gone into a wide rollout. However, it's starting to look like there might be a winner. There's no certainty that this particular interface will go any differently, but the evidence has been growing since v11.41 and even includes a tutorial overlay to explain some of how the feature works for users. We've seen tutorials created for features that were later removed, but that's relatively rare. Referred to as "quick seek" in the code, this implementation appears fairly normal. Users are instructed to double tap either left or right arrows to jump 10 seconds back or forward, respectively. It's not clear if there are any other ways to do shorter or larger jumps, or maybe activate a high-speed playback. Left: image used with tutorial text. Right: image is named ic_ffr_triangle.png. It's not like the details are particularly special or interesting, but the fact that there's some activity is a reason to think YouTube is ready to commit to launching quick seek sometime in the near future. I know I'm more than a little eager to see it. I'm not going to say anything special about this one, I just saw no reason not to include it. There's a new filter named 'Dance Party' coming to the video upload screen. It doesn't appear to be live yet, at least not for me. So, yeah, that'll be a thing eventually. Quite simply, if you land on a movie, you'll soon see the Rotten Tomato scores floating somewhere on the screen. Right now it's unclear if the images will only appear for the movies themselves, or if they may also turn up on movie trailers or possibly even references to movies. Oh, you thought that already happened? Or maybe even forgot it was supposed to? It was announced at the end of June with a timeline of "soon." About a week later, a teardown showed that work had at least begun. Since then, there hasn't been a peep about live broadcasting from the YouTube app. It certainly seems like the announcement may have been premature, or perhaps the switch from Hangouts-On-Air to YouTube Live set the timeline back a bit. Bear in mind, YouTube Gaming has even had live screencasting (with a camera view of the player) for more than a year, though it's obviously not designed to target the same social element. Whatever the reason(s) may be for the later-than-expected launch, it seems work has resumed. Right from the start, the permission request for camera and microphone access mention going live. Of course, if you're going to go live, you might not be doing it in the best-lit environments. Whether you're closing out Disneyland or lurking through a haunted house, you'll be able to light up whatever the camera points at with the LED on your phone. If your viewers are complaining about bad video quality and compression artifacts, you'll be able to turn on the 'stats for nerds' display and check out your current bitrate, frame rate, and resolution. While you might not be able to control the quality of your connection, you will have the option to manually set your bitrate and frame rate, or even flip on a setting to allow the bitrate to change as needed. These options should make it possible to choose where to make sacrifices to keep your stream playing correctly. None of these give any indication of how much longer it will be until YouTube launches live broadcasting through mobile devices, but again, the activity is what matters. Alternate Title: The Google Finally team writes a to-do list for YouTube, challenges Android Police to avoid using the word "finally"
Weekend poll: Do you make NFC payments?